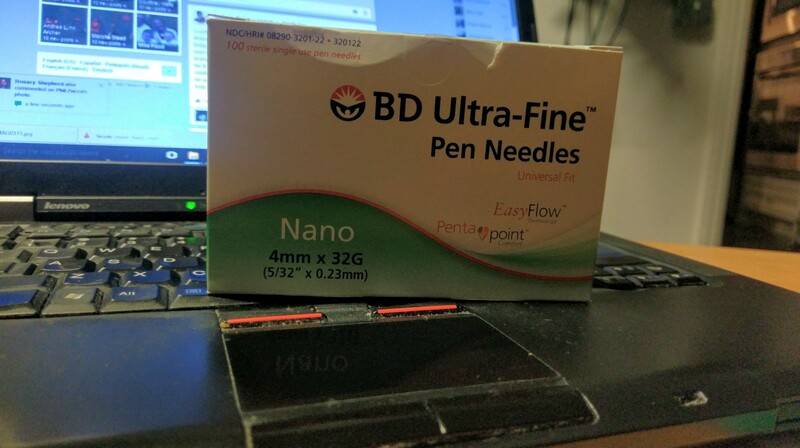 I am about to break open a new box of “BD Ultra Fine Pen Needles.” These are the ‘sharps’ that puncture my skin when I inject insulin. They screw onto the end of the pen device that dispenses it. #30 needles–close to microscopic. Clearing out a box means I’ve injected myself around a hundred times already! That’s crazy. I am running out of fresh places around my tummy. Like everything else inserted into my life recently it’s a bother more than anything. An inconvenience. There’s really no choice but to do it. Are you aware that you can also inject into your upper arms and thighs. The absorption time is a bit longer, but by minutes, not hours. I’ll go to Web MD or find my med-surg book and get the time differences. Also, with the Glucose machine you have, you don’t have to just use your fingers—you can use anywhere on you arm that you can reach. I have a nurse friend who never pricked her fingers—only her lower arms. Just a thought. If you are in fairly good control now, I would try injecting into the top surface of your thigh or the upper arm (at least 2-3″ above the elbow. When you were running extremely high they had you use the abdomen, as that has the quickest absorption. Because of all the weight lost the other spots are more difficult. I heard that pricking your fingertip on the side of it to test your blood will hurt less. Does not hurt at all. I have found they use larger needles in the doctor’s office. At home it’s painless. I’ve given myself so many thousands of shots over the past 14+ years that I’m pretty much immune to it. I do rotate my shots around my stomach area as well as my waist. With night time insulin, I don’t do thighs (muscle pain) or arms (limited dexterity). I usually use the arms and thighs for daytime insulin (less pain unless I hit muscle). Judging by the size on the box, I’m guessing that yours is on the large size?